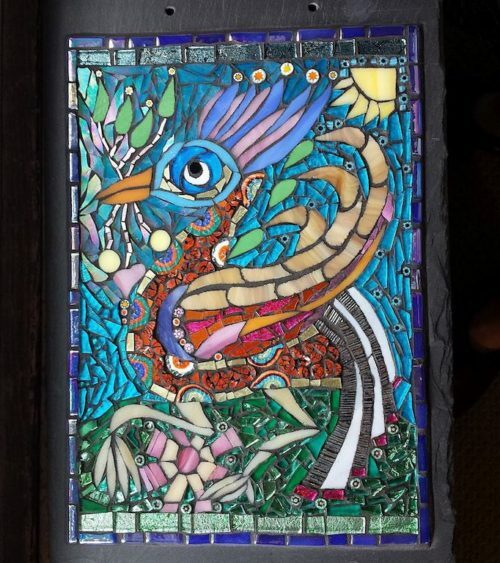 Heart Song: Fantasy Bird Collaboration with Nutmeg Designs and Suzi Beber, glass and millefiori on slate, 9.5×14 inches. 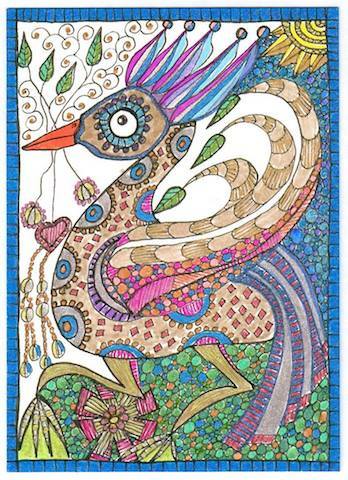 Stratoz did the initial bird pieces and left spaces open for me to create texture and sparkle. 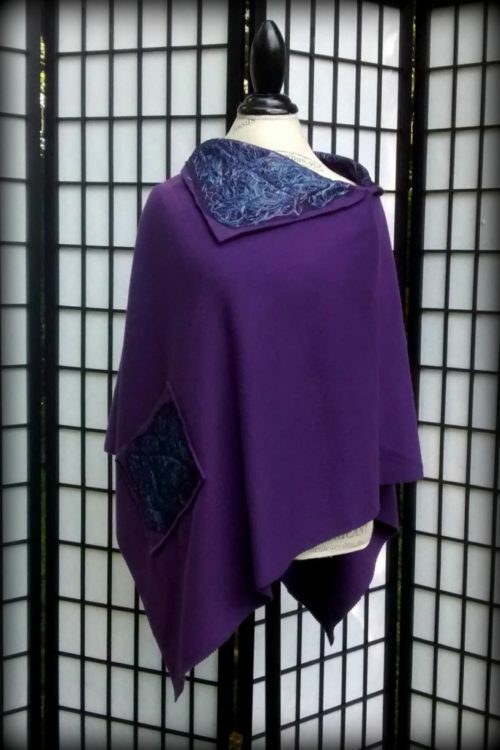 HMB Studios beads and Italian millefiori beads helped capture the intricate details in Suzi’s work. It is an honor to be entrusted with someone’s creative expression, and an expansion of my own imagination. 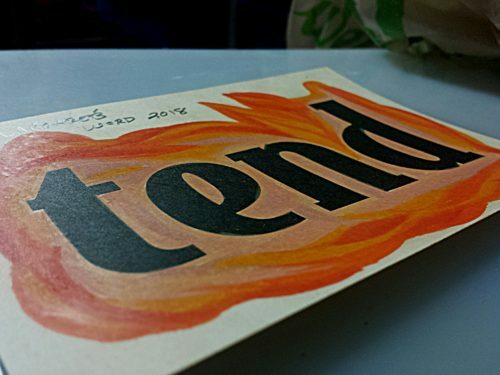 My #oneword for 2018 is Tend: to pay attention, direct energies, to stretch toward my life and take care of the things that matter. Stratoz kindly colored the background orange for me. I have it in my studio where I can see it every time I walk by. 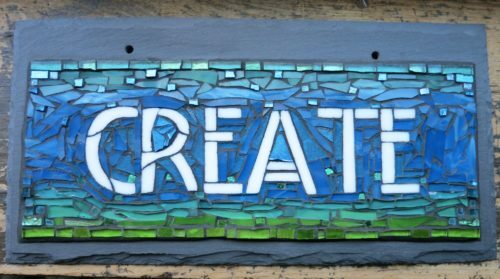 Choosing a word as a touchstone for the year began for me in 2016, when someone commissioned Nutmeg Designs to make a mosaic sign of the word Create because it was her word of the year. I realized this was a word that inspired me as well, because when I am creating, rather than consuming, I am rejuvenated. Word of the Year 2016: Create, by Nutmeg Designs. Glass on slate, 12×6 inches. The word I chose for 2017 was Up. I had made a sign with that particular word because of my experience with Alexander Technique lessons and the concept of feet rooted on the ground, and the head up, as if with the help of invisible threads. I also was inspired by all the aspects of up: Show up. Speak up. Stand up. Rest up. Get up. 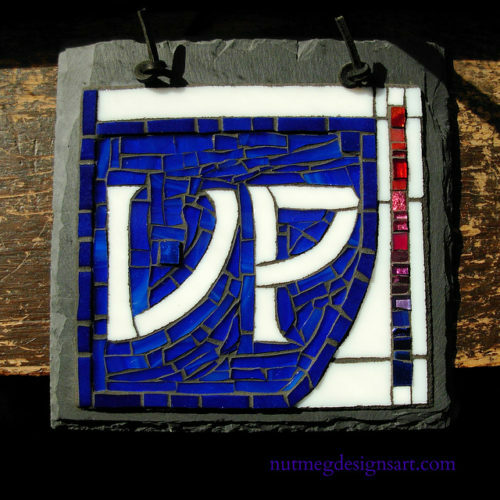 Up in Mosaic by Nutmeg Designs, glass on slate, 8×8 inches. What is your word of 2018? Why did you choose it? Fundraiser for The Stained Glass Project: Windows that Open Doors in Philadelphia. On July 29th, 2017, I celebrate my 50th birthday. 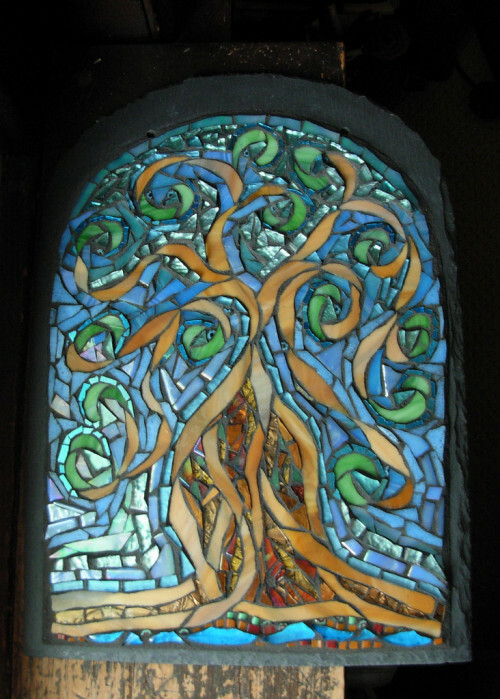 To mark this occasion, I want to raise $1000 for The Stained Glass Project(SGP) in the month of July. Making glass art transformed my life, and I want to pass that gift of transformation onward. Artmaking has enlivened me, as has the sustaining love people have shown me in my life. 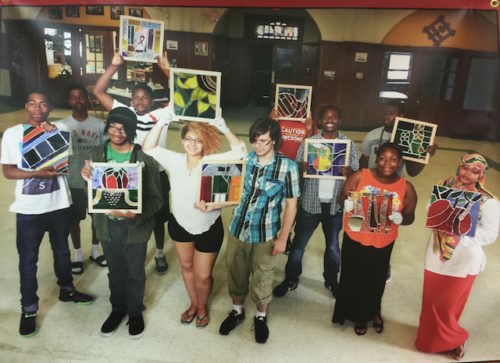 The Stained Glass Project is a manifestation of other artists, Paula Mandel and Joan Myerson Shrager, who took the enlivening power of art and the power of love in action, and started this extraordinary program in 2007 for Philadelphia public high school students to make stained glass and gift it to schools around the world. Over the next weeks, I will be sharing stories and work from the Stained Glass Project on my GoFundMe page. You can make a difference by donating $5.00 or more by July 31st, 2017. Thank you to Unitarian minister Chip Roush sharing the source, and the important context of this quote. Dr. Howard Thurman was an African-American mystic and theologian, spiritual advisor to Dr. Martin Luther King, and co-founder in 1944, of the Church for the Fellowship of All Peoples in San Francisco, the nation’s first intentionally interracial, interdenominational church. Read about how I first stumbled across a display of work by students from the SGP in 2010 when I missed my train and walked to Love Park, and found an exhibit of their stained glass windows at the Welcome Center. The windows were for a school in South Africa. 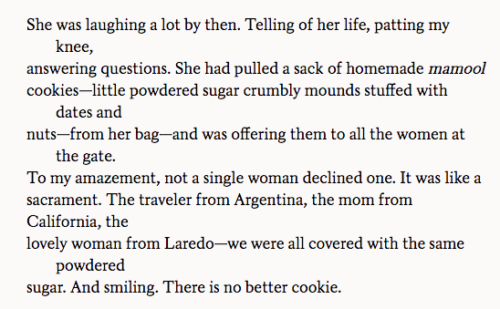 Excerpt from Gate A-4 by Naomi Shihab Nye from her book Honeybee. 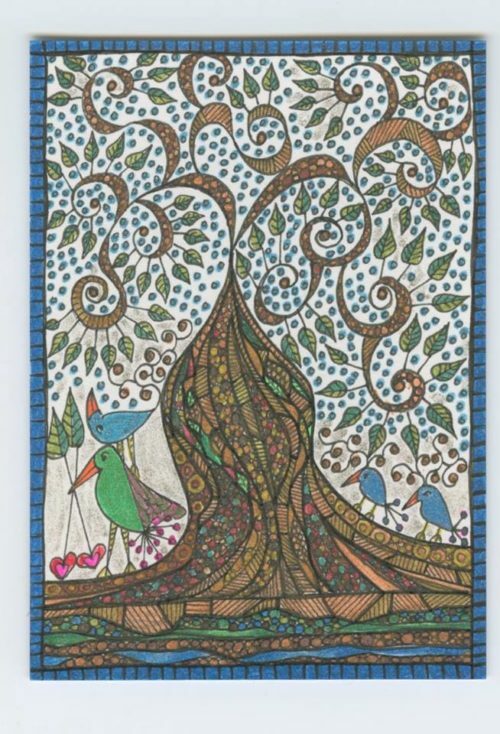 Getting ready for our Nutmeg Designs 2017 Open Studio and Food Drive for Manna on Main Street, I thought of this poem, Gate A-4 by Naomi Shihab Nye. Nye tells the story of being at the airport and hearing an announcement asking if anyone spoke Arabic, and she goes to Gate A-4 where a woman in Palestinian dress is crumpled on the floor. Nye talks with her, and we are all transported to the shared sacrament of mamool cookies that the woman pulls from her bag. Our show is an occasion to bring food for Manna on Main Street, which began with the vision, “That everyone one might be fed,” for those simply in need of a good meal and company. Our visitors brought an estimated 450 food items, and heartened me with their generosity. Take a minute to listen to Naomi Shihab Nye read the whole poem. It is wonderful. This is the world I want to live in, the one where hearts open rather than break.